Brewing beer - more involved everyday. But more interesting, too. 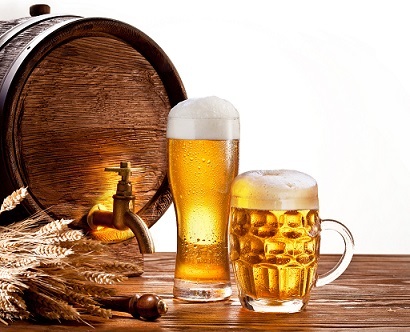 Traditional beer is simply an alcoholic beverage made from water and malted cereal grain, such as barley and wheat, flavored with hops, and then fermented with yeast. 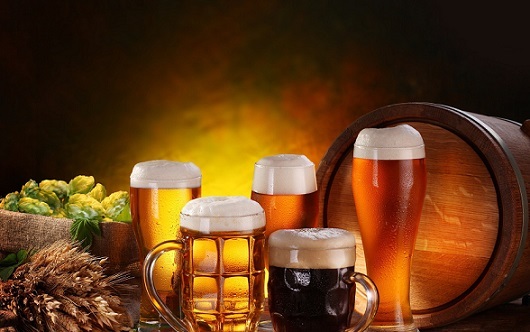 But, as described on the first page about beer, the creative, modern brewers have greatly expanded the list of possible ingredients ranging from beets or garlic to powerful flavor enhancers for traditional stouts and pale ales. Malt is the foundation of beers. To create malt, barley is dampened until it germinates. It is then dried at controlled temperatures causing the barley's starches to turn to sugar. Different types of malt are made by how long the drying process continues. Longer periods of drying create darker colored malts which produce deep roasted flavors. Brewers use specialty malts, including chocolate and black malts, to create dark beers such as stouts and porters, while using paler malts in amber and pale ales. After the brewer has his recipe in mind and the materials have arrived at the brewery, the actual process for brewing beer begins. The malted barley is run through a mill to finely crush it in order to extract the sugars that the yeast will use in fermentation. This finely crushed malt is then mixed with water in a large brewing tank, called a Mash Tun. The mix is gradually heated to a set temperature and the process converts the starches of the malted barley into sugars. The brewer then transfers the mix to another large tank called a Lauter Tun. A small amount of hot water is added to the tank to extract the sugars from the malt, resulting in a thicker, sweet liquid called wort. A false bottom in the Lauter Tun strains the spent grain and allows the wort to transfer to the Brew Kettle. Once in the Brew Kettle, the wort is brought to a continual boil and the brewer adds hops at different intervals to achieve different flavor profiles. Hops are the spice of beer. Hops added early in the boiling process impart bitterness, in the middle are for flavoring, and at the end are primarily for aroma. After the boiling is finished, the wort is transferred to the fermentation tanks, where the brewer adds the yeast to start fermentation. This is where wort becomes beer through the magic of fermentation. Depending on the yeast strain used, a beer will either become an ale or a lager. Ales are beers whose yeast ferments at the top of the tank and that are fermented at warmer temperatures. Ales are generally fruity, robust beers. Lagers are beers whose yeast ferments at the bottom of the tank and are fermented at cooler temperatures. The cool lagering process produces smoother beers with less assertive aromas and flavors. 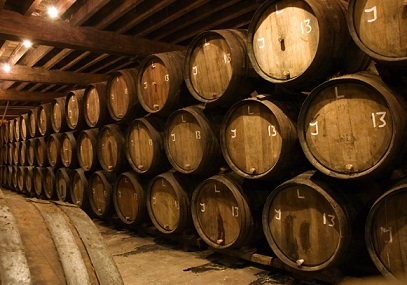 The length of the aging process is also influenced by the type of yeast used. Ales generally age for three weeks, while lagers age for six to eight weeks. Since water makes up more than 90 percent of the finished product, the mineral content of the water used in brewing beer makes a difference in the finished product, as well. Brewing Beer Is Done. What Foods Match What Beers? That's the basic brewing process, but that only brings us back to the question, how do you match a beer with a food item? This article on brewing beer and food matching can point you in the right direction, but you have to also do your own research. I have a great additional resource listed below and a suggested approach on how to pursue your interest. The first thing about beer to remember is what I also say about wine: There may be some general guidelines, but ultimately you need to taste for yourself and make your own determination. Consider first the strength of the beer. Is it a "low impact," "medium" or "big impact" taste? To have a successful match, you’ll want to match the strength of the beer to that of the food. A heavy-duty beer will overwhelm delicate fish, and a lighter beer may seem flat when you’re enjoying a barbecue. A wheat beer may match that delicate fish perfectly, while a darker ale will stand up to the ribs. If you think a beer and a dish are pretty well matched in terms of strength, you’re probably right. Now think about the flavor of a beer. Beer can have flavors of caramel, coffee, chocolate, bread, bananas, limes, herbs, smoke or raspberries, just as examples. Your goal is to either find harmonious (enhancing) flavors with the food, or pleasantly contrasting flavors. As with pairing wine with food, there are some very general rules of thumb, but things become more interesting when you consider how food is prepared and what it is served with. For instance, amber ales, amber lagers, brown ales and light porters all have flavors that will match a roasted chicken beautifully. In fact, beers with a camelized flavor go well with roast pork, steaks, barbecued ribs, and grilled vegetables. But what if you used herbs when roasting that chicken? Now you should think about not only matching the flavor of the chicken, but also the herbs you used. Most American pale ales have some citrus character from hops and that can be used to match Mexican, Thai and Vietnamese dishes, which are often flavored with lime. Those hop flavors also work wonders with chilies, ginger and cumin. Any dish that has flavors of char, coffee or chocolate is a good candidate to match brown ales, porter and stouts. Grilled ribs, burger and steaks are obvious matches, but their flavor is so powerful that these beers can even match roasted peppers. Cajun-style blackened chicken or pork go well with these beers, too. Wheat beers match a wide variety of dishes. Some wheat beers are a perfect match for Eggs Benedict (Hollandaise sauce match and a pleasant contrast to Canadian bacon). Beers with a hint of orange flavors are perfect with egg dishes. Wheat beers are also great for salads and they won't "fight with" vinaigrette dressings. Wheat beers are also great with seafood including crab, oysters, fish, shrimp and lobster. Matching desserts is one of the greatest talents of big stouts and porters. Strong stouts, especially imperial stouts, can provide perfect matches to chocolate desserts. Try (experiment) with a really strong stout. A match is often better when a beer is not sweet and provides a brief "rest" from the sweetness of the dessert. Now it's your turn to do some research. Here is a suggested resource about beer you might be interested in reading. 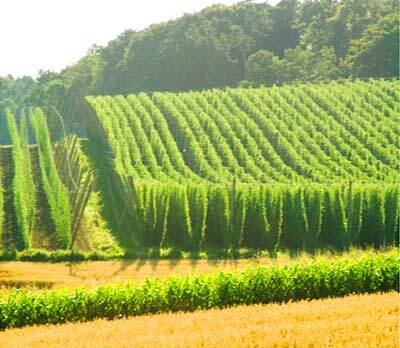 Don't forget - Read the first article about beer and brewing beer. Thanks for the visit! Enjoy this information about brewing beer. It will help you enjoy a cold one and your meal even more ...really! “Why beer is better than wine: "....human feet are conspicuously absent from beer making."